Air101: United Airlines adds flights for CES 2019 in Las Vegas. An extra 8,500 seats added. United Airlines adds flights for CES 2019 in Las Vegas. An extra 8,500 seats added. The US mega-carrier, United Airlines has advised today that will be adding more than 8,500 seats from its U.S. hubs and eight other U.S. cities to connecting more customers than ever to Las Vegas for CES 2019 in January. CES is the very popular trade show where new products are unveiled and next-generation innovations are introduced to the marketplace. "We want United Airlines to be the first choice for business and leisure travellers planning to visit Las Vegas for CES," said Ankit Gupta, United's vice president of Domestic Network Planning. "Our enhanced schedule to Las Vegas offers customers more nonstop flights from our hubs and new nonstop flights from eight of the country's top technology and business centres." 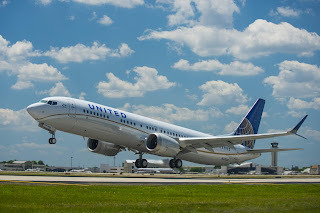 In addition to United's regularly scheduled daily nonstop services between its seven hubs and Las Vegas, United has added nonstop service to Las Vegas from eight other cities across the United States including Austin, Texas; Fort Lauderdale, Florida; Raleigh-Durham, North Carolina; San Jose, California; Boston; Pittsburgh; San Diego; and Seattle. "We are delighted that our partners at United Airlines will be expanding service to Las Vegas during CES," said Cathy Tull, chief marketing officer for the Las Vegas Convention and Visitors Authority. "Helping visitors connect to Las Vegas with the convenience of additional nonstop service during such a high-profile event is critical to the continued growth and success of the show and our destination as a whole." From its hubs in Chicago, Denver, Houston, Los Angeles, New York/Newark, San Francisco and Washington, D.C. United will offer up to 48 nonstop daily flights to Las Vegas between Jan. 6 and Jan. 12, 2019. To help connect more customers to Las Vegas and CES 2019, United will operate select flights between Las Vegas and New York/Newark and San Francisco with Boeing 777-200 widebody aircraft, which are typically reserved for international flights. Beginning January 13, United will resume regularly scheduled flights between Las Vegas and its hubs in Chicago, Denver, Houston, Los Angeles, New York/Newark, San Francisco and Washington, D.C.